The second thing that you notice – and this is so noticeable that it was recognized by astronomers at telescopes on the ground long before Galileo arrived and long before adaptive optics gave pristine views -- is that on the reddish trailing side of Europa the water ice looks funny. As you remember from Part 1, the water ice looks funny because is because we are not really water ice, but water that is adsorbed on to something else. It looks similar to water ice, but different. This map of the non-water ice stuff on Europa was taken by measuring spectral ratios across the disk. Where the ratio is low (the red and black regions) there is mainly non-water ice material. Where the ratio is high (white, yellow) there is mostly water ice. In the blueish regions there is a mixture. The image also shows the limit of spatial resolution at the Keck telescope. From the Voyager image on top pick out the crater just south of the equator at about 270 degrees longitude. Now find that spot in the Keck image. You can see it. But just barely. Am I looking forward to the next generation of bigger telescopes on the ground that will have ~3 times better spatial resolution and be able to isolate features such as that crater? Why yes, I am. The darkest regions on the map show the places with the least water and the most of whatever-else-it-is. The blue to yellow shows some ice to nearly pure ice regions (the white parts show the regions we didn’t quite cover). The image above it is the composite map from the Voyager flyby. The thing you see most clearly is what I told you earlier. The non-water-ice stuff is strongly concentrated on the “trailing” hemisphere of Europa, which is the one that Io’s sulfur slams into and the one where the reddish material is. Interestingly – and this will play an important role when we try to explain what is going on – there is non-water-ice stuff on the leading hemisphere, too, just not as much. But we can do more. Much much more. Instead of just figuring out where the non-water-ice stuff is, we can also try to figure out what it is. And we do that by looking at the spectrum. If we isolate all of the most non-water-icy material – the stuff that is black in the map above – and look at the spectrum of it, we see nearly exactly the same thing that the Galileo spacecraft saw 15 years ago. There is one tiny, almost unnoticeable exception. Right next to one of the spectral regions that is dark because of water ice there is a slight decrease in the amount of light reflected. It’s a small enough spectral region that the Galileo spectrograph didn’t have the chance to see it, but, looking at 40 times greater spectral detail you can’t miss it. Though that little blip (“spectral feature” we call it) is tiny, and we didn’t immediately know what caused it, we did know one thing immediately. It was not caused by sulfuric acid. Just this little bit of information is critical: something is on the surface of Europa that is not an obvious by-product of sulfur ions hitting water ice. This result already answers one of the questions we set out to address: is the reddish non-water-ice stuff on the trailing side of Europa all sulfuric acid? No. No it’s not. While much of the reddish material is likely still sulfuric acid (remember: it has to be there), there is definitive evidence now that there is something else there. But we can do more. Much much more. 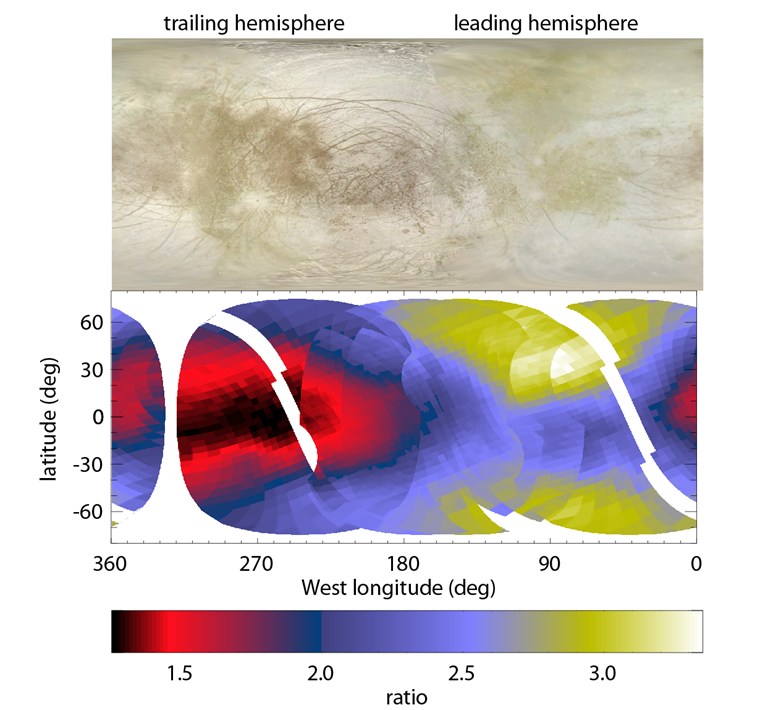 We can try to figure out what chemicals on Europa’s surface cause that new spectral feature. The first thing we did was to carefully map out where we see that new spectral feature. We had found it by looking at the reddish material, but where else might it be? The answer, which surprised us greatly, is: nowhere else. This new spectral feature, which doesn’t look like any expected chemical species that we would expect from sulfur ions bombarding water ice, appears on the parts of the surface where sulfur ions are bombarding water ice, and nowhere else. Weird. Very weird. We went to the laboratory to try to reproduce that new spectral feature. (I should mention, at this point, that “we” is me and my friend and colleague Kevin Hand, who is a scientist at JPL specializing in Europa, among other things). We tried normal things (dissolve salts in water, freeze them, look at the spectrum), we tried slightly unusual things (freeze Epsom salt, crush it, sieve out big particles, medium particles, tiny tiny partucles, take spectra), we tried truly strange things (freeze Drano, grind it up, take a spectrum). In all of these experiments we only found one material with the new spectral feature. And that material is one that had been suspected all along: epsomite, a magnesium sulfate salt with water bound to it. If you remember back to part 1, epsomite was one of the favorite salts that people thought had been detected on the surface of Europa. But, if you remember back to part 1, you also remember that the actual evidence was quite thin and that it was more of an inference based on what people thought the ocean composition might be. The argument was, essentially: we seen non-water-ice stuff on Europa which might be salt, we expect the oceans to have magnesium and sulfate, thus those salts must be magnesium sulfates, and, with the not-very-precise data that we currently have, they could well be magnesium sulfates. I will admit that I always found this line of reasoning unconvincing, so magnesium sulfates were the last thing that we expected to find. But there they were, just as had been predicted for 15 years. Two parts of this story don’t add up. If magnesium sulfates are coming from the internal ocean and making it to the surface of Europa, why do they only do it on one side? And why does that one side happen to be the side with sulfur raining down on top of it? Suspicious, no? The other part of the story that doesn’t add up is that, as you will recall from the map above, the leading hemisphere of Europa does have non-water-ice stuff on it, but that non-water-ice stuff does not appear to have a large concentration of magnesium sulfate. Looking at the spectra of the leading hemisphere, even with the better view form Keck, we still don’t really know what it is. And, finally, there is one more clue. More than 15 years ago, when I was a freshly-minted Ph.D. looking around the solar system, I discovered anatmosphere of sodium atoms surrounding Europa. A few years later (when I was at Caltech and finally could use the mighty Keck telescope on my own!) I found potassium alongside the sodium. All of these years, we have assumed that the sodium and potassium come from the salts on the surface of Europa and that these salts get knocked off the surface of Europa (by the radiation, among other things) where we can see them in the atmosphere. So the question you might want to ask is: hey, what about magnesium? If there are magnesium salts shouldn’t magnesium get kicked up into the atmosphere? More than ten year ago, my then summer undergraduate research fellow, Sarah Horst, looked for magnesium using data from the Hubble Space Telescope. She didn’t see any. “Huh” we both said, and put the data in a drawer and didn’t think about it for most of the last decade. When we detected the magnesium sulfates a few months ago, I realized it was time to dust off those results. I called Sarah, who had gone on to graduate school, finished, and is now a postdoctoral fellow at the University of Colorado, and said “let’s write that paper.” We did, and it came out recentlyin the Astrophysical Journal Letters. In that paper we showed that magnesium is undetectable in Europa’s atmosphere, and, for this to be true, magnesium can’t be dominant. 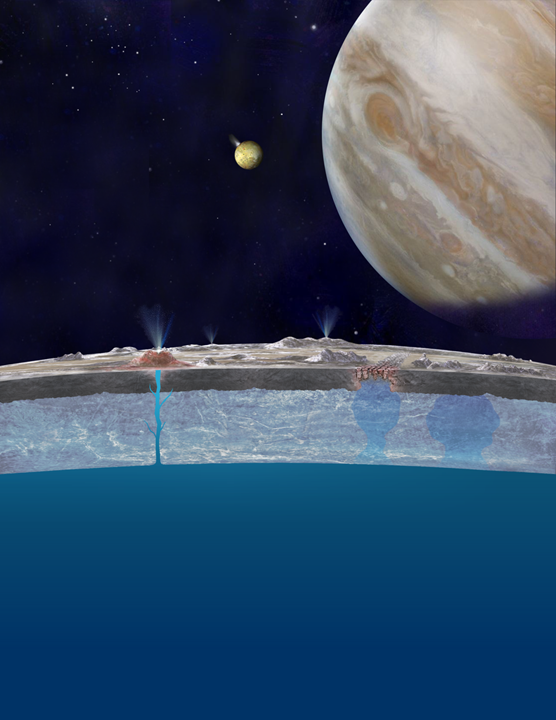 It seems unlikely that ocean-derived magnesium sulfates would only cover one side of Europa. It seems even more unlikely that that one side would also happen to have sulfur raining down. Sulfates. Sulfur. Hmmmm. So what if, instead, the sulfate (that’s SO4) is formed by sulfur slamming into ice. And the irradiation breaks about the magnesium salt and created magnesium sulfates. That is exactly what happens to make sulfuric acid on Europa’s surface, but now magnesium is involved instead. In what form is magnesium originally? We don’t know. We’ll call it MgX. The leading side of Europa, which appears to have no magnesium sulfates, is, presumably, instead covered by MgX. But not too much of it, because there is more sodium and potassium than magnesium, it appears. So, most likely, the surface has NaX and KX, too. But what is the mysterious chemical X? Here, we have no direct evidence at all, so we have to resort to inference. This inference is not much better than the one about sulfates that I complained about earlier, but it is the best we can do, so we are going to do it. Examining the chemistry of the solar system and asking ourselves about likely oceanic components and ruling out sulfates really leaves one major suspect: chlorine. Which would make the important salts on the surface NaCl, KCl, and MgCl2. You’ve heard of NaCl before. You call it salt. The others are in our oceans here on earth, too. This chlorine hypothesis – the “sea salt hypothesis” we like to call it – if true, implies major difference in the ocean chemistry with chlorine being an important component of a chemically reduced ocean. But we’ll talk about chemical implications later. We made this cool picture for the press release. How exactly it is supposed to demonstrate our results I am not certain, but it's cool looking, no? The surface of Europa has magnesium in some salt form. Salt from the ocean gets on the surface. If salts get on the surface, other stuff gets on the surface. While people have speculated for a while about drilling down to the ocean to find out its composition, it doesn’t sound like that is important. If you want to know the composition of the Europa ocean, go lick the surface. When you do, we suspect that it may taste surprisingly familiar to those who have recently ingested an accidentally mouthful of sea water. While no one is going to be licking the surface of Europa anytime soon, the great power of modern giant telescopes at Earth will be used increasingly to take spectral fingerprints of increasing detail to finally understand the mysterious details of the salty ocean beneath the ice shell of Europa. What happens next? We look for chlorine, I think. The existence of chlorine as one of the main components of the non-water-ice surface of Europa is the strongest prediction that this hypothesis makes. We have some ideas on how we might look; we’re working on them now. Stay tuned. While these posts have been extra long (longer than the scientific paper, I think, since there was a lot of background to get through), you now have enough background and inside knowledge that you might even consider, for fun, reading the scientific paper on which all of this is based. You can find it right here. Thank your for your insightful explanation about the mysteries regarding the salty world of Europa. Although you just mentioned it in passing and in jest, you wrote "It [Galileo] was old on the first day it took data at Jupiter. (It was intentionally crashed into Jupiter in 2002 to prevent, among other things, an accidental crash into Europa, which would clearly disturb the whales)." 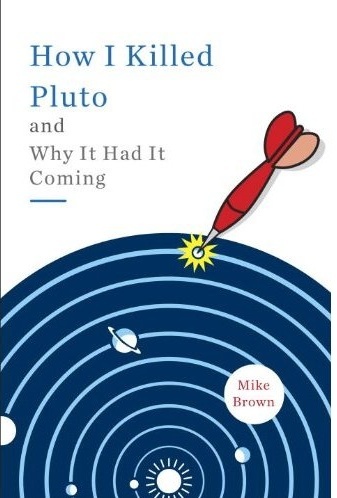 Well Mr. Brown, it seems that those (at NASA) with ethical heads on their shoulders, agree that the potential risk of cross-contamination of terrestrial (Earth) organisms with those (possible) on Europa, was reason enough to deliberately disintegrate a spacecraft via plunging it into the crushing depths of Jupiter. If such a policy exists regarding the potential contamination of another world that may disrupt or even destroy life on it, what morally sound reason does NASA and similar agencies, have regarding missions to places like Titan (Cassini-Huygens), Enceladus (Enceladus Explorer) and Ceres (Dawn and possible manned mission)? I think missions to map and otherwise explore, potentially life harboring worlds is needed for our knowledge, but to do so from orbiting spacecraft; not landing spacecraft. What precautions are being taken to prevent even microscopic terrestrial organisms from getting into extraterrestrial ecosystems? Since some living terrestrial organisms have been found on spacecraft that have been in space for quite some time, the prospect of contamination is real and for such a huge topic to go without thorough discussion in both scientific and public forums is unconscionable. What policies are in place if we discover life on another world, i.e. do we collect it and return it to Earth (dead or alive) so scientists may study it? Do we study extraterrestrials only in their native environment (live and let live)? What happens if we accidentally bring an extraterrestrial life form to Earth? Some of the aforementioned questions may seem moot or even preposterous, but some things may have seemed equally preposterous including landing people on the Moon, supersonic flight and splitting atoms, just 100 years ago. G. Smith, you could just spend two minutes with Google and look this stuff up yourself. Cassini will be crashed into Saturn, to burn up in the atmosphere. Dawn will never touch Ceres or Vesta. Huygens underwent a complex decontamination based on international protocols. "Enceladus Explorer" is a hypothetical mission that wouldn't launch for at least another decade. Seriously, dude: before you comment again, just google for a few moments. There's a lot of literature on this. You can start with the Wikipedia article on "Planetary Protection". Anyway: I have two questions for Mike. One, when would you reasonably expect to have access to better spectra? Three years, five years, ten years? And two, the only currently planned mission to Jupiter's moons is JUICE -- currently scheduled for a 2022 launch and a 2030 arrival in the Jupiter system. What might JUICE tell you, that you wouldn't expect to already know by then from Earth-based observations? Thank you for your comments, however my issue with (surface) exploration is a morality based one (in general), not meant as a condemnation of the mentioned missions. I am just opening a discussion on the issue and do not need to add to Google's traffic to investigate or research all of the ongoing and proposed missions, i.e. the topic is for discussion only. President Obama has mentioned in his directive that he wants astronauts to land on an asteroid by 2025 and through some basic sleuthing, Ceres, a dwarf planet, has not only been chosen as a prime candidate for this visit, but is also considered in the scientific community based in part to its proximity to the Sun and perhaps having a liquid water ocean like Europa, Titan and Enceladus, to be a prime candidate to harbor life. Penetration tests are being conducted on thick terrestrial ice packs and sheets so we could penetrate through the "protective" crust of ice that covers most of the aforementioned worlds. Once in a liquid water ocean, a probe could introduce invasive terrestrial organisms that may infect or compete with indigenous species. There is no means to completely decontaminate spacecraft as we cannot even decontaminate hospitals; people frequently get sick or infected while at a hospital, from viruses, bacteria and other contaminants (germs). Germs have an efficient way to survive, they have done so for perhaps millions of years and would probably be assured of surviving even after a global nuclear war. You think engineers/scientists can get rid of 100% of the germs on a spacecraft, probe, rover or spacesuit, we cannot even cure or vaccinate people against the common cold. Once we have introduced a virus or other organism to an extraterrestrial world, it is quite difficult to put the genie back in the bottle. All I want to discuss is what do people think about the dilemma, i.e. do we explore and cross the proverbial bridge when we come to it or do we plan and have policies in place regarding extraterrestrial life. Remember, there are several other countries with space programs and there needs to be worldwide policies (and perhaps laws) regarding extraterrestrial life. I know that religious leaders may want to bury their head in the sand concerning this topic, but that does not mean that rationally, logically and ethically minded individuals have to, too. I know there are perhaps "loose" policies regarding extraterrestrial life, but they are not strict as in the case of the Cassini-Huygens mission, where the genie may already be out of its bottle. Perhaps another more likely scenario involves the unintentional introduction of an organism(s) that originated from Earth to another world where no indigenous life exists. It is possible for some Earth organisms to adapt to the conditions and environment of other worlds and forever change and corrupt the environment of the world? Whatever scenario actually happens has yet to be seen, but such scenarios are more likely with each world people explore. In the not too distant future, humans will colonize the Moon, then perhaps engage in commercial mining operations on asteroids, then colonize Mars etc. From strictly an environmental perspective, there is absolutely no environment, whether teaming with biodiversity or devoid of life, that humans have not damaged or destroyed in some way. In the case of the Cassini-Huygens mission, I find it contradictory to direct Cassini into Saturn for destruction so it could never crash onto any of Saturn's satellites and contaminate them, yet it is okay to land a manmade probe (Huygens; that was attached to Cassini) onto Titan's surface; what did Cassini have that Huygens does not? No matter what precautions scientists/engineers take or protocols they follow, inevitable accidents will occur. If you think our protocols regarding sterilizing (or keeping an object sterile in the first place) objects is flawless, then look at the infection records of hospitals. Still not convinced, look at the protocols followed by Russia, Japan and the U.S.A. regarding nuclear power plants; all of these countries have space programs and all of them had serious nuclear accidents. Regarding worlds with atmospheres such as Mars and Titan, the risk of widespread contamination is much greater because organisms could be made airborne and blown around. Titan may experience other types of weather such as rain and/or snow, making water or other liquid contamination possible. NASA and other space agencies need to devise and implement a policy regarding exploration (and other activities) of other worlds as it pertains to environmental and astrobiological/astroecological issues. Actually, one other question. If there's H2SO4 on the surface, and there's regular exchange between surface and ocean, don't you end up with a lot of H2S04 in the ocean? In other words, something a lot more like battery acid than ocean water? includes a spectrometer and a spectrograph. I have a question: could the magnesium come from meteorites? Then it would be in the form of silicates, and might be converted to sulfates on the trailing hemisphere? Some years ago there was a blurb or two describing work by Brad Dalton on the some aspects of the Europan spectra, near-IR IIRC,... can there now be any follow-up on that extraordinary but very preliminary study? Thinking about it, it seems chlorine might be in a little short supply for space colonization needs. It's pretty volatile. What happens to salt on Venus? It should form lakes, the temperature is about right. How much of the Na, K, and Mg in Io's volcanic plumes gets ionized and whisked away by the Jovian magnetic field? Thanks for the informative article. It turns out the delta-v requirements to return a sample from Europa are surprisingly low. Then it's possible such a Europa sample return mission could be mounted by the SLS or even by the Falcon Heavy, which is scheduled for a first test launch in 2015. Mike thanks as always for your research and your blogging. I have no doubt we could get a sterile probe onto the surface of Europa. The Mars mission already deals with the contamination issue quite well. We therefore need not fear landing on Europa (not to mention the fact that massively sterilizing conditions already exist on Europas surface). What I do fear is that we will continue putting off any meaningful missions to Europa or Enceladus in the near term. It absolutely boggles my mind that there are currently no concrete missions planned to go to bodies where the existance extraterrestrial oceans have been confirmed.